"The Spirit of the Lord God is upon Me because the Lord has anointed me to preach good tidings unto the meek; He has sent Me to bind up the brokenhearted, to proclaim liberty to the captives and the opening of the prison to them that are bound; to proclaim the acceptable year of the Lord and the day of vengeance to our God" (Isaiah 61:1-2). This great and programmed prophecy, the Lord Jesus read at the beginning of His saving work before the Jews in Nazareth, and having read this He sat down and said: "Today is this scripture fulfilled" (Luke 4: 16-21). One of the darkest prophecies for the Jewish scribes and priests, He read, closed the book and said: "Today is this scripture fulfilled." None of the Jews dared to touch this prophecy for no one knew to whom this prophecy pertains. Seven centuries have passed since this prophecy was spoken and written and no one knew to whom it pertains. 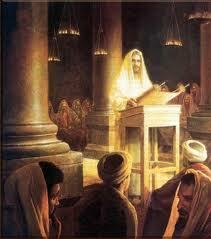 And when that One [Christ] came, upon Whom this prophecy pertains, He read it and applied it to Himself. Thus our great Lord justified His prophet and presented Himself to the world. "The Spirit of the Lord is upon Me." Why does He speak so when He is equal to the Spirit as He is to the Father? As St. Chrysostom interprets, it is for the sake of witnessing to the people. He does not say the grace of the Spirit [is upon Me], for the grace of the Spirit is upon the faithful people, but the Spirit Himself is upon Him as was manifested at the Jordan River. The Spirit is the witness of the Son and the Son was never without the Spirit for one moment. The Lord Jesus often mentions the Father and the Holy Spirit first out of infinite love toward the Father and the Spirit and love always ascribes its own to others, and second for the sake of instruction to proud men that they do not emphasize themselves but rather to give honor to others equal to themselves. Everything else that is said in this wonderful prophecy, the Lord fulfilled by His miraculous works, word for word. He came primarily to proclaim the mercy of God to men, but at the same time to proclaim the Dread Judgment to those who would despise and reject that mercy. This is the vision of Isaiah, the son of Amos, the prophet of God, the true prophet. Brethren, let us venerate Isaiah whose God-inspired mouth foretold the Savior and our salvation and let us worship without ceasing our wonderful Savior, the Lord Jesus Christ. We worship You our Lord and Savior and we give You thanks for Your all-wise plan for our salvation. To You be glory and thanks always. Amen.